My legs are feeling surprisingly good today after running the NF 50 mile ultramarathon yesterday in 8 hours, forty seven minutes. I had an amazing race finishing with a personal best earning me second place in my age group. Who would have thought Washington DC had good trails? This race featured 50 miles of some of the prettiest trails I’ve ran. It was moderately hilly, and not overly technical, despite 2 crashes – the first was just after the 5:00 am start in the dark when I tripped on a rock and landed hard resulting in a bruised and bloody hip and finger. My second fall was near the cliffs over looking the Potomac river. It was many hours into the race and the foot to eye coordination required to step over large boulders was seriously lacking. I tripped and fell (luckily not into the river!) forehead first onto a rock. Ouch!!! That one really hurt! I have a cut and a small welt on my head. The first 2 hours were fairly slow due to the narrow path and hundreds of runners that were all in front, so I just sort of let the slowest at the front set the pace and figured I would conserve – especially since it was difficult to see the trail in the dark. When the trail opened up to a wide and inviting gravel path, I decided to step on the gas and shifted up to what I would classify as a marathon long run training gear – breathing hard, but short of an all-out marathon pace. My mental calculations had me finishing at around 9 hours which I knew would have put me at the top of my age group in last years race, but the day was not too hot and humidity was low, so I knew that finishing times would be fast. I was surprised by how little I was eating and thought I should make a mental note that perhaps some of the stomach issues I’ve had in previous races could be due to eating too much? I ate 2 small packs of chocolate cookies, a few crackers, a hand full of m&m’s and drank a couple of small cups of coke at each station. Maybe my low food intake was due to my carb-loading: spaghetti and meatballs for 2 dinners before the race. Whatever it was, I never really felt tired or sluggish. 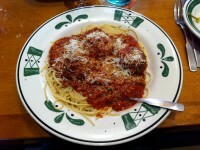 (Mental note: don’t forget about the spaghetti and meatballs – 2 meals prior to race). During the last 2 hours, I didn’t see any 50 milers around, so I sort of figured that I might be doing well. As usual, that last few miles to the finish line took forever and by then I really was in agony trying to keep my pace up. I was thrilled to see a third place finish on the race stats! Helen pointed out to me later that I placed third in the 40 – 49 year group, but actually placed second in my correct 50- 59 group. A day earlier when we picked up our race packages, I noticed the error on my race number and immediately reported it to the 17 year old girl working at the North Face store who whipped open her lap top and after 2 or 3 keystrokes and a single mouse click, confidently assured me that it was all good, and that the error had been fixed. Of course, I had no reason to doubt the technical proficiency of a teen age girl working in the fashion industry who didn’t even want to see my ID, and mysteriously had full and immediate access the to race database, so I was happy that the issue was resolved. I truth, I really could care less about this. As Helen and I walked out of the store we had a good laugh as we pondered the chances that any real correction in the database had taken place. Northface does an AWESOME job with this series of ultras which is why we have run 2 of them, and will absolutely sign up for more. Helen ran her second ultra which was the 50 km race, and she said that she felt it was one of her funnest races ever, finishing 7th in her div. 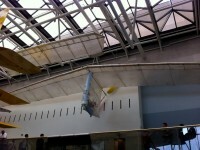 We toured the Smithsonian Air and Space museum today and I got to see the Gossamer Condor which was a thrill for me. A couple of decades ago, I read the book by Paul McCready and i credit that book as one of my key inspirations toward my eventual human powered pursuits. 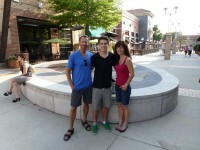 We are taking a few days to visit our son Cody who is going to school in Durham, North Carolina – one of our favorite places! The next event on our calendar is the K100 relay race in Kananaskis, then Helen and I are going to hike the west coast trail with 2 good friends. We expect it to take 5 days and we’re already fully kitted up with new backpacks, and tents. I have TONS of dehydrated food still from Pedaltheocean expedition that was cancelled, so we’ll be good for food. After the WCT, we are taking the kids on a cycling trip through Ireland which I’m really excited about. Then in September, I’m going to run the San Fransisco One Day ultramarathon again. I loved that race so much last year that I talked Helen into running the 12 hour race. My goal is to improve on my 4th place finish and 101 miles last year which won’t be easy. I caught a break last Sept due to so many runners quitting because of the rain. If the weather this year is reasonable, I won’t have that advantage. Then at the end of September, Helen and I are thinking of a self supported bike trip down the California coast. We cycled the Oregon coast many years ago and have always wanted to go back and finish the left coast. We have a few weeks between now and the K100, so I’m kind of thinking of maybe finding a flat and fast marathon and going for a new PR. I feel like I’m in pretty good shape for knocking on the 3 hour door and I’m thinking that I might need to leverage all the good run training I’ve got under my belt right now. A 3 hr marathon has been a long, long time goal of mine and I do realize that I’m not getting any younger. I need to strike while the iron is hot! Oh – I forgot one more thing: my buddy Bryon and I are thinking of climbing mount Assiniboine in August! And we want to do it fast, ultra marathon style. No rest, no sleep. I’ll keep you informed – I’ve seen photos of the climb and the scenery is amazing. Great race! I did the 50k. 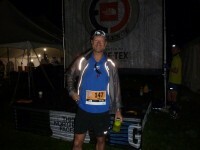 It was my first ultra and one of my favorite races in the 10 or so years since my first race. Hope to do it again next year. If I am feeling brave enough I might try to tackle the 50-miler … doubtful though! Hey Greg … sounds like a great fun race. Glad it went so well for you and Helen. 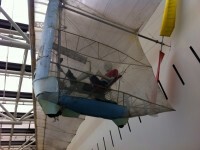 Neat that you saw the Gossamer Condor (what’s that?) … which inspired you towards … human power. … and then inspired many others. I’d like to see you do a flat and fast marathon … go for it. 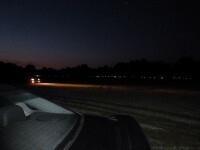 Thanks for yet another great race report Greg! Great job! It’s been awhile since we last chatted, I’m a long-time follower & admirer, first time commenter. 🙂 I’ve been running off and on since the Chaparral Triathlon we competed in together, along with Tom, back in 2000 (I think). My summer plans… I did a few Halfs and mixed in a couple short 10K races last year, but the road running just isn’t quite my thing. This year I’m focusing on trail running, which has me signed up for a hand full of the 5 Peaks Challenges. I love the man vs. the elements aspect, it’s way more appealing to me. My second race of the season is coming up this weekend in Canmore. You could still register too if you’re interested, although they might be too short for you. Meanwhile, I’m getting the itch for some of the longer and more challenging stuff. If only I could out run my bad diet and log the training hours required. 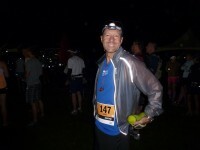 I’ve registered for the Canmore Rocky Mountain Half in mid-Sept (again). greg, i’ve been following you for years. i’ve always been a fan of HPV ingenuity and have congratulated you many times. i think you have a good brain. i’m writing because i’ve been such a fan of yours for so long. and I have congratulated you a lot. so i’m writing to tell you i feel this is crap. the is uncreative accomplishment setting. this isn’t a mountain, it’s not an ocean, you are setting a fully random number and just telling people to pay attention to you ( everyone in the ultra-endurance field is doing this ). i’ve hiked 42 or 43 miles in one day for fun, not to win a race or to brag about a non-accomplishment. human beings have travelled with their legs for hundreds of thousands of years, and many humans who are now part of ancient history would probably laugh and be confused seeing modern human’s trying to brag about running what to them might be a perfectly ordinary distance ( to travel for survival ) for no reason at all but to get attention. being in good shape is a process and part of the journey. setting up 50 mile races and other ultra-endurance nonsense is what happens when uncreative physical people who are not content with triatholon competition want to eek out a non-sport sport.